For over 100 years Central Mount Stuart, about 210km north of Alice Springs WAS considered by most as 'The Centre' of Australia. The cairn that was erected here back in 1960 stands close to the highway while the peak itself is just a few kilometres west and plainly visible from the road. John McDouall Stuart, possibly Australia's greatest explorer, had named the peak in April 1860 when he found by his observations of the sun that he was camped in the centre of Australia. Like any good explorer he marked a tree and planted the British flag on its crest. Stuart had been on Sturt's 1844 expedition and when he found himself in the heart of Australia 16 years later he named the peak, Central Mt Sturt, in recognition of Sturt and his considerable achievements. Only later was the peak's name changed. Now there are at least six different spots that vie for the title of the 'Centre of Australia'! 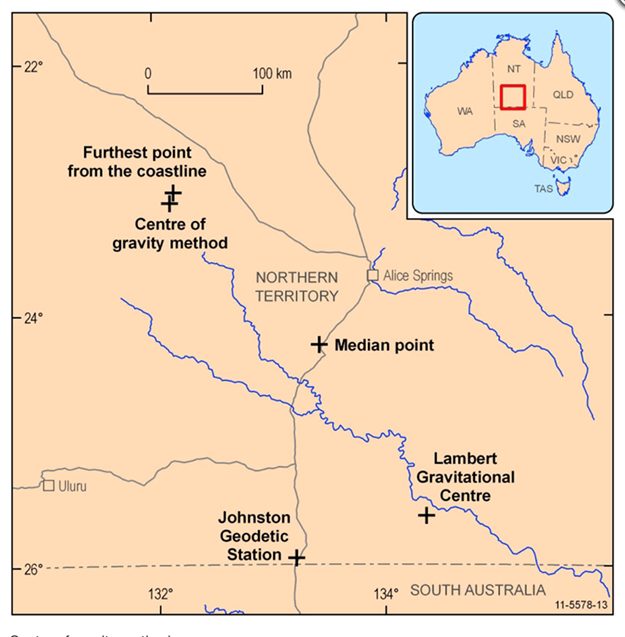 In 1965 as part of the major upgrade to surveying in Australia the Australian Geodetic Datum (AGD) was established as the standard mapping system in the country (since replaced by the even more accurate Geocentric Datum of Australia) and the Johnston Geodetic Station was established in central Australia as a major reference point. This cairn was built by the Division of National Mapping and is located about 1km north of Mt Cavenagh homestead, just north of the SA/NT border. Then in 1988 the Royal Geographical Society of Australasia, looking for something to celebrate the Bicentennial, decided on working out the Gravitational Centre of Australia. By all accounts the location was calculated from 24,500 points spread around the high water mark of Australia's coastline. 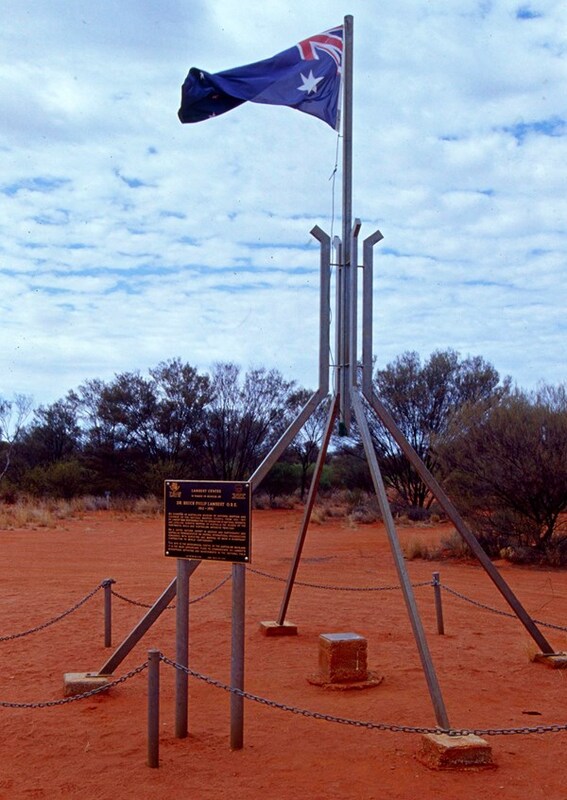 A major monument (a smaller replica of the flag pole that adorns Parliament House in Canberra) has been erected here, 32km north of the Finke-Kulgera road. There's a visitors book here which gets a surprising amount of entries. Now researchers with Geoscience Australia have come up with a few more 'Centres of Australia'. The 'Furtherest point from the Coastline' was found by, rather crudely I thought, drawing a series of concentric circles on a piece of transparent material and moving that over the top of a 1:5 million scale map of Australia. The centre point is where the largest circle that could be drawn inside Australia that only just touches the coastlines. This point is located north-west of Alice at 23°02'00" South, 132°10'00" East. They could probably be more accurate if they tried harder! The 'Centre of Gravity' point was worked out from more than 50,000 digitised points around the Australian coast and each was assigned a weight. The resultant centre point is where you could, theoretically, balance Australia on a pin and is located, surprisingly to all concerned by all accounts, very close to the Furtherest Point marker, at 23°07'00" South, 132°08'00" East. Still, this wasn't the first time anybody had tried to find the centre of gravity of Australia though. In the 1930s when Dr C.T. Madigan travelled through Central Australia and across the northern Simpson Desert, he calculated the centre of gravity of the continent by using a metal cut-out of Australia with a plumb bob and string. 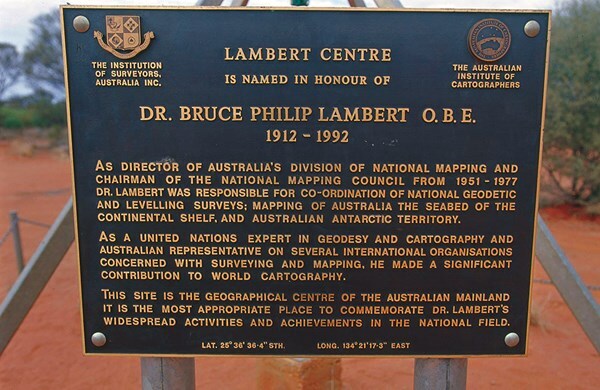 His measurement was surprisingly accurate as he selected a point less than 11km due west of the current Lambert Gravitational Centre, and not all that far from the Centre of Gravity point selected by Geoscience Australia. The 'Median centre point' of Australia was calculated as the midpoint between the extremes of latitude and longitude of the continent. That point is located at 24°15'00" South, 133°25'00" East, and is not far west of the Stuart Highway, south of Alice Springs. You can find more info at: www.ga.gov.au, and search for 'centre of Australia'. For me, I'll stop at the Central Mt Stuart memorial whenever I go past; the others I can possibly do without, although the Johnston Cairn may just tempt me off the highway to go and find it one day in the not-too-distant future.